Scene of the protest yesterday. 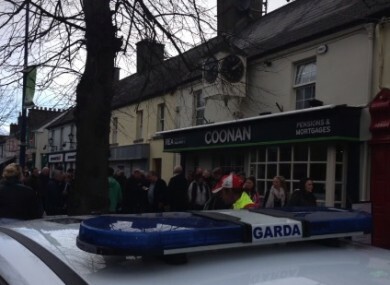 GARDAÍ WERE CALLED to a real estate agent in Maynooth yesterday after people staged a sit in protest ahead of an auction. The gardaí confirmed that the they were called to REA Coonan estate agent at around 12.15pm. It is believed that people refused to leave the premises and were protesting against the sale of farms that are in legal dispute. The organisers called on the estate agents to sign up to what they called the “industry standard” agreement which Allsop Auctioneers signed up to last week, which agreed that no properties in future will be offered for sale where there is a legal dispute in connection with the proposed sale between the registered owner and the bank or receiver. Allsop signed the agreement with the action group Friends of Banking Ireland after a sit-in last Monday. Following yesterday’s sit-in in Maynooth, REA Coonan estate agents also signed an agreement, honouring the same terms. Following the agreement being signed, the gardaí confirmed that the crowd dispersed at about 2.15pm and that no arrests were made. Speaking to TheJournal.ie, Jerry Beades of Friends of Banking Ireland said the protest was to highlight an issue that is impacting on 500,000 people around the country that are in financial difficulty. He said the sit-in in Maynooth centered around the selling of a farm where there was a dispute between the owner and the bank, where he said the bank would not communicate with the owner. Beades said they told the estate agents that until they agreed not to sell any properties that are in dispute “they would be showing up every week if necessary”. Beades said that this protest was just one against something that is happening all across the country. He said that Friends of Banking Ireland are calling on all auctioneers and estate agents to sign up to the agreement that no properties that are in dispute be sold without consent of the owner. He said that this was where the “pressure points” are, adding that while it is a “slow battle” to ensure agents sign up to the agreement, that it was a necessary struggle. “It is about time that the government did something about the situation,” he said. “We are just a bunch of business people, we are not thugs,” he said, adding, that “everyone is in the same boat. Some of the men that came yesterday to support the farmed in question knew that it could be them in the same situation 18 months down the line, so it is about supporting one another,” he said. REA Coonan could not be contacted at the time of publishing. Email “Gardaí called to auction sit-in protest in Maynooth”. Feedback on “Gardaí called to auction sit-in protest in Maynooth”.